Smashbox's Friends and Family sale starts today. Use code FF2011 at checkout on smashbox.com to get 20% off your order (and free shipping like usual). Sale ends 5/27/2011. In honor of the sale, I thought I should finally post my review of the new Smashbox Limitless Long Wearing Gloss. 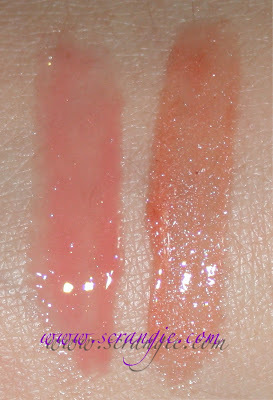 I have the two shades from the In Bloom spring collection, Endless Kiss and Timeless. On the top is Endless Kiss and Timeless is on the bottom. Endless Kiss is a light pink-orange coral with very subtle gold shimmer and Timeless is a warm shade somewhere in between peach and caramel with subtle silver shimmer. 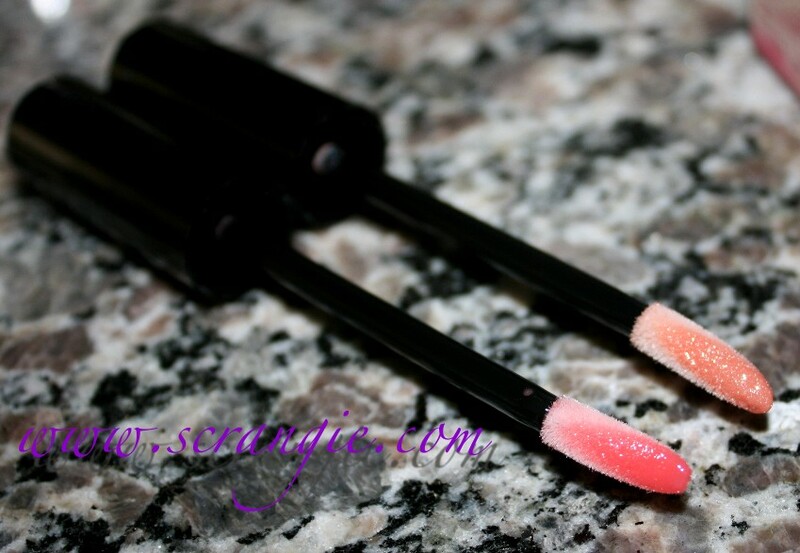 The Limitless Long Wear gloss comes with a slanted and very elongated doe foot applicator. I don't know if you can tell from this picture, but the sponge tip part is nearly two times the length of an average doe foot applicator (like MAC Lipglass, for reference). Here are the glosses applied heavily on the back of my hand. Endless Kiss on the left, Timeless on the right. The shimmer is more visible because of the flash, but it's not noticeable on the lips in daylight. The formula on these is extremely thick and sticky. 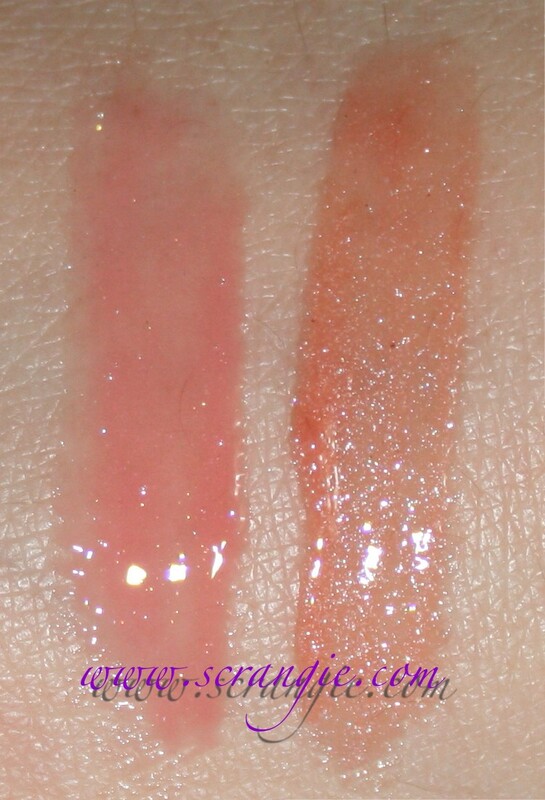 This is a long-wearing gloss formula that claims six hours of wear, so I can understand the stickiness, I just didn't expect it to have this texture. This is honestly one of the stickiest glosses I've ever used. Apart from the sticky texture, it makes this weird film on the lips that feels very strange when you rub your lips together. It's like molasses or something. Very, very odd sensation. The scent is nice. I can't really think of what exactly it smells like... It's not quite fruity, but it's not perfumey/flowery. It's light and sweet, but not sugary candy sweet. Actually, it smells a little bit like suntan lotion, so maybe it's just the combination of SPF in the formula and the gloss base smell. As for the long-wearing feature of the gloss, it is and it isn't. It claims six hours of shine, but that hasn't been shown true during my testing of this. For me, the shine was gone after an hour but the stickiness of the gloss lasted on my lips all day. So yes, it stays on forever, but you can't really tell by looking at it, just by the feel. I'm pretty torn about this gloss. I love the idea of a long wearing gloss with SPF, especially for the summertime, but the formula and color intensity aren't what I expected. My main issue with this gloss is that it's so SHEER. Against the pasty white skin on my hand, these colors look sort of bright, but on my lips they're nothing more than a faint tint. Both colors look the same on me and only add the tiniest hint of color. If I'm going to pay $22 for a gloss, I kinda want it to look like something, you know? I can get clear lip balm with SPF and a glossy finish for under $8, so a $22 gloss has to offer me more than SPF to make it worth buying. I personally found the formula to be uncomfortable on my lips. It was just so sticky and not smooth, and it stays on your lips forever, even if you try to wipe it off. I hoped it would be a little more slick and glossy and not as glue-like. I love that it has SPF. I remember reading an article somewhere that said the shiny/glossy finish of lipgloss on the lips can put you at more of a risk for skin cancer, just like using baby oil instead of sunscreen when tanning. That, and the skin on your lips is so delicate and sensitive that you want to use SPF just for comfort. My favorite SPF lip product has been Jack Black lip balm (love that stuff, SPF 25), so I hoped this gloss would be a colorful alternative to that. I still prefer the Jack Black balm. That's just my take on these. Too sticky, too sheer, and leaves a long lasting film but not a long lasting shine. If these were less sheer I might be able to justify the price of them. I know there are other shades in the range, so maybe those have a bit more color to them, but these two shades are just too close to clear for me. But, hey, if these sound like something you might like, they're on sale today! I really like the shimmery one!!! Aww, it is too bad they're sheer. They'd be great if they were more opaque.